As women increasingly become a larger part of the professional workforce, downtown San Jose wants to be known as HER city, an after work event series launched by theSan Jose Downtown Association (SJDA). HER city events are set to inspire and rejuvenate professional women. Past events have been crafted around downtown's best amenities with a VIP experience in mind. As Blage Zelalich, SJDA deputy direct puts it, "Participants will feel like VIPs as they enjoy socializing, food, drink, retail therapy, arts/theatre, beauty/fashion and do it yourself activities." For this SJMADE Mini Mart installation, our goal is to create the feeling of an exclusive small scale boutique--a handful of female entrepreneurs asked to show off their fantastic products and goods! 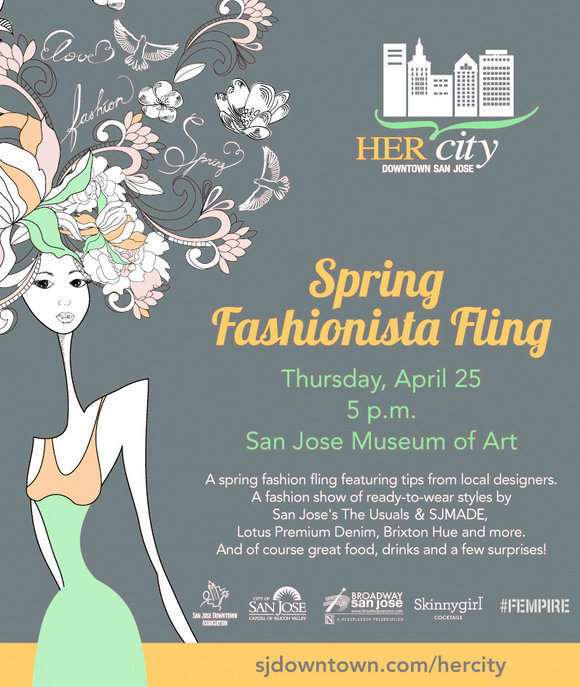 San Jose's hottest spring fashion event this April! The hottest spring finds brought to you by The Usuals, a handful of SJMADEvendors, Lotus Premium Denim, and more!